The Vanderbilt Center for Structural Biology (CSB) is part of a major trans-institutional initiative to significantly upgrade the capabilities in Structural Biology at Vanderbilt by bringing additional faculty and state-of-the-art instrumentation to campus. The CSB was developed to promote the broad use of structural biology approaches in all life science research and to provide a focal point that bridges medicine and biology to math, chemistry, and physics. The philosophy of the CSB at Vanderbilt is to integrate the application of all techniques that can provide the atomic resolution structure of biomacromolecules. 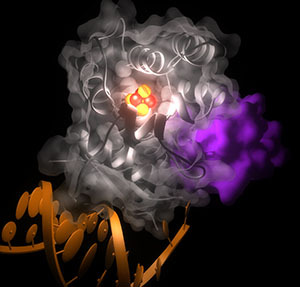 The merging of applications of the traditional high resolution structural biology disciplines, X-ray Crystallography, NMR Spectroscopy, and Computational Biology, along with electron microscopy and fluorescence and EPR spectroscopies, is especially unique. This strategy is being increasingly recognized as the necessary approach to solve fundamental structural problems in medicine and biology. Establishing an environment that provides access to all available tools provides Vanderbilt investigators with key competitive advantages. This philosophy is being successfully applied in exciting ways in collaborations with investigators from a range of Departments in both the College of Arts and Science and The School of Medicine.